Your Brand would be displayed on the Tables (As Tables’ Top Stickers) located at Food Court, Elante Mall, Chandigarh. Complete Table of Approx. Size 2 ft. x 2 ft. would be covered. Massive Footfall: More Than 12 Lakhs Captive Audience Crowd is targeted per Month ensuring a grand brand visibility with Zero Ad Avoidance. 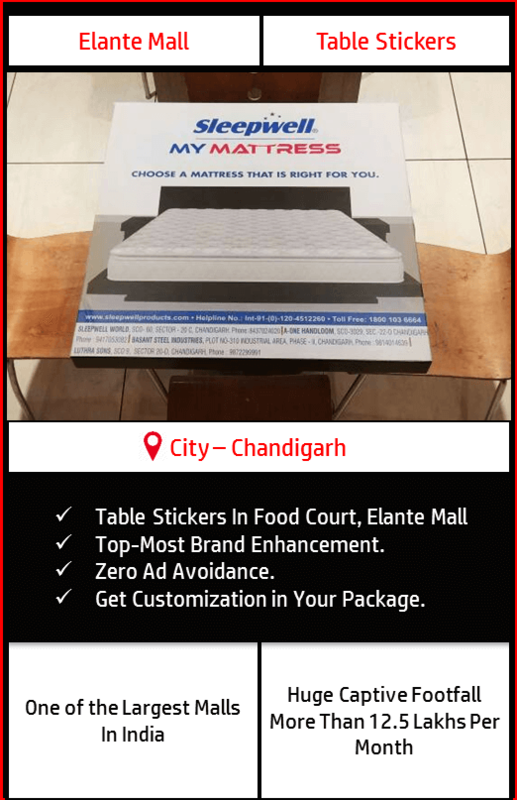 Make your own customized package by choosing a variety of Options below which best suits your budget & requirements. An entire table of size 2 Ft.x 2 Ft. will be covered by the client’s branding. 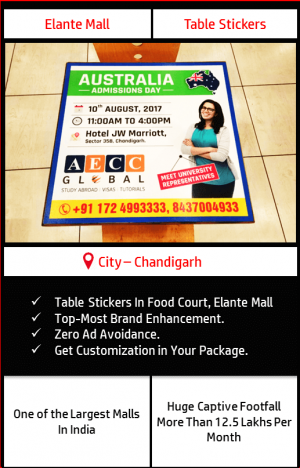 More Than 9.5 Lakhs is the Captive Audience Crowd comes in Food Court every month & spends at least 1 hour sitting while having their meals. Hence, There is no possibility of Your Brand gets avoided which Simply tends to ZERO AD AVOIDANCE. 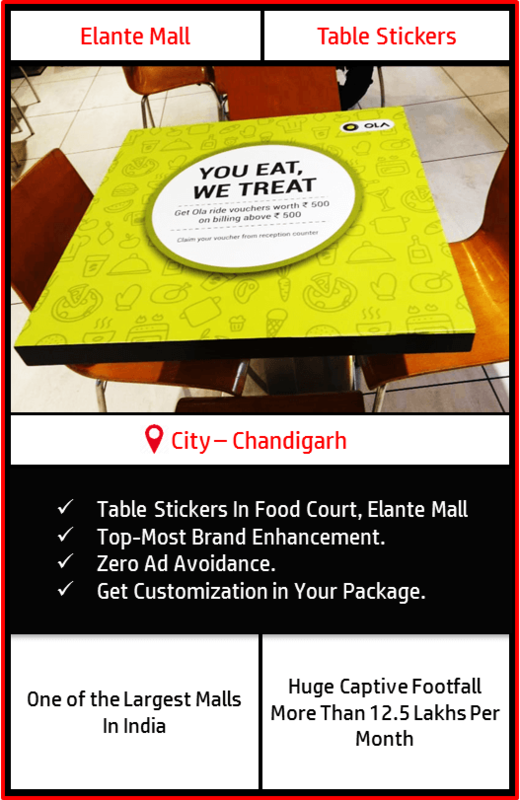 The tables fill the entire food court comprehensively to give your brand a complete strategic advantage & top of the mind recall amongst your target audience. Printing and Mounting one time are complementary with the package bought. Great Return On Investment ensuring Top-most Brand enhancement (Best amongst all media in the town). 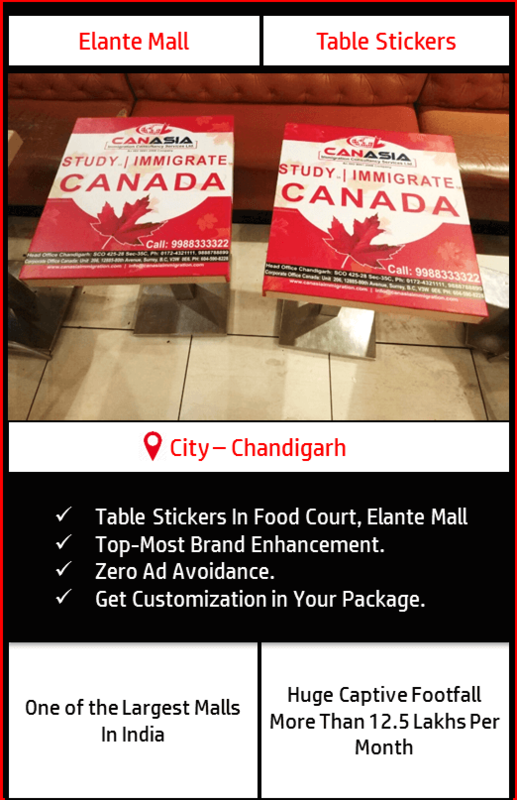 The client can create its own tailor-made advertising campaign by choosing from a variety of strategically made customized options best suiting to its budgets & requirements. The Creative has to be provided by Client himself in both CDR & high-resolution JPEG format. If creative is to be changed by the client, minimum 15 days should be left in the campaign. The costing for change in creative would be borne by the client itself. 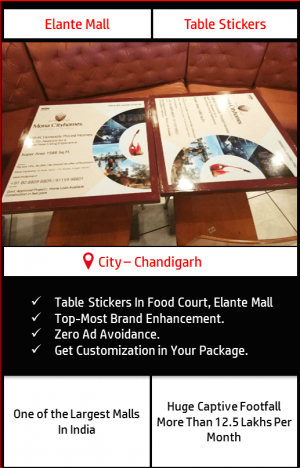 The material of the table stickers has to be changed in 3 months. 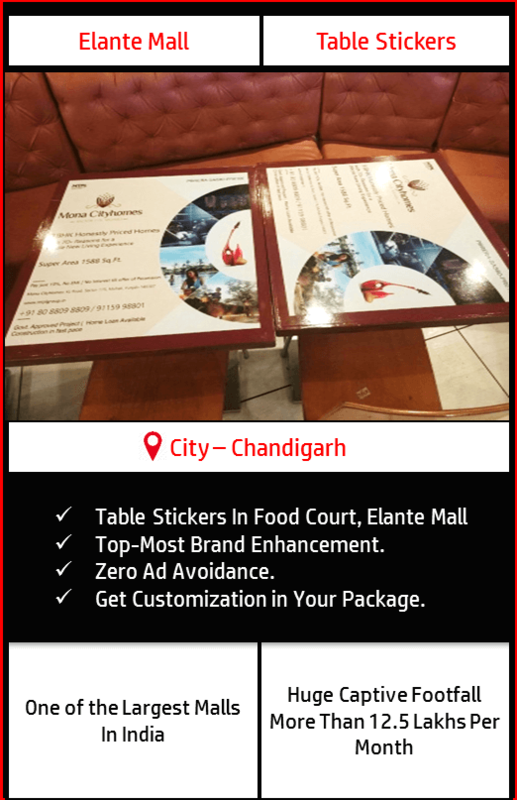 In case of damage to the table stickers within 3 months, the client would be intimated from our side. The new material costing, in any case, has to be borne by the client itself. Exact sizes would be shared with the client at the time of booking of the campaign.